Marvel Universe Chronology 02. Reading the Marvel 616 in order. Fantastic Four #2. I had nothing to do with putting that list together but I commend them for such a massive project. I am also not going to split hairs over whether every single issue listed is exactly where it should be. It looks good enough to me. I will be reading these comics and putting a podcast about each on our Patreon feed if you are interested. Also, Tonya from When It Was Cool will be reading many of these issues as well. She has basically zero comic book knowledge, though obviously, knows many of these characters through pop culture and movies. The second comic book in our read-through of the Marvel Universe (616) continuity is the Fantastic Four issue 2 which was published in January 1962. This issue introduces us to our second villains in the Marvel Universe, the space alien race The Skrulls. The Skrulls would become major recurring characters throughout the history of the Marvel Universe even thought their first appearance was largely comical in nature. We will do a companion podcast to this article very soon for Patreon subscribers. The art in the issue is a little rougher than in issue one. The Thing (Ben Grimm) and the Human Torch (Johnny Storm), in particular, are drawn very roughly and simply. Artist Jack Kirby is legendary for his science fiction and future tech designs, as well as, blocky character style, but some of the panels in this issue leave a lot to be desired. The Skrulls, who are supposed to be a hideous alien menace, are also drawn more comical in nature and ultimately meet their fate in humorous fashion. The very first panel of the issue shows a rather crudely drawn Thing swimming toward a well designed oil platform. at this stage of the marvel universe, the human torch is still drawn featurelessly and simply. This issue revolves around a common comic book trope, especially in the 1960's and 1970's, where the heroes are set up to look like the villains and the general public is skeptical or outright fearful of them until the heroes ultimately prove themselves innocent. 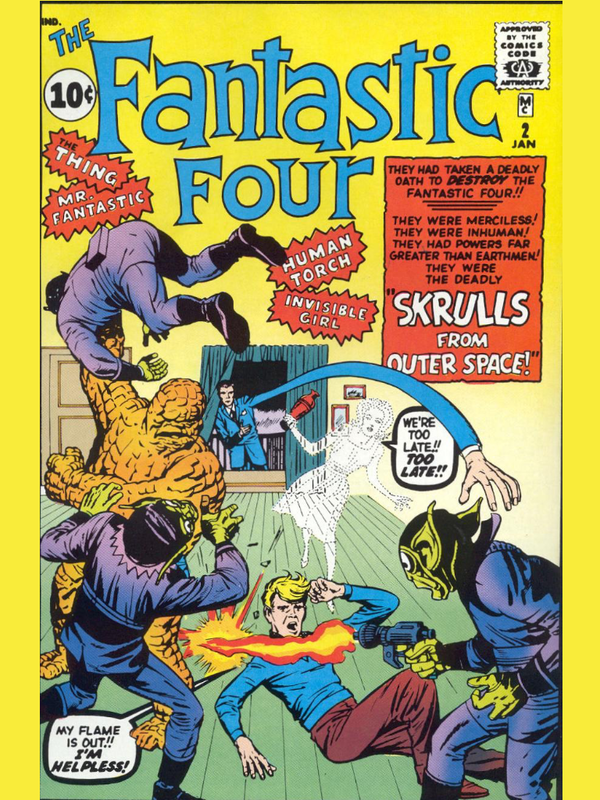 In this issue, the shape-changing alien race, the Skrulls, impersonate the Fantastic Four in order to have them arrested to clear the way for their alien invasion. The Fantastic Four escape and ultimately fool the Skrulls into thinking conquest is impossible by showing them issues of Marvel comic books featuring the popular giant monsters of the time. The Skrull agents which remained on Earth are hypnotized into shape changing into cows where they will harmlessly graze forever more. The Fantastic Four are ultimately cleared of any wrong doing. There is one tragic sequence in Fantastic Four issue two where Ben Grimm momentarily turns back into his normal human form only to, shortly thereafter, change back into the monstrous Thing. It should be noted that, unlike last issue, Reed Richards takes full responsibility for the accident which caused their mutations and shows remorse for Ben Grimm's particularly distressful metamorphosis. The Skrull invasion is foiled simply by the Marvel Comic book titles "Strange Tales" and "Journey Into Mystery". Both titles will soon be part of our timeline reading. Three Skrull agents left behind on Earth transform into cows where they are hypnotized into forgetting how to change back in a particularly humerous ending to the issue.